We have a part in the City of Monticello's upcoming launch of a new promotional video web page. Dahlheimer Beverage will be among the featured businesses and sponsors. Last week I photographed activity at the local distributor's warehouse and at Monticello's Hi-Way Liquors, one of Dahlheimer's many customers. 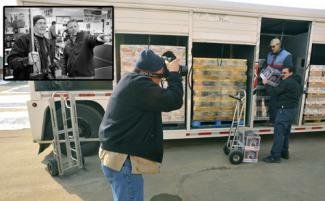 Jim Douglas, a friend and photojournalist at KARE 11 TV, shot these photos of me at work.